Hello everyone! How have you been? Hubby and I (and also my Mom) went to Cyprus for a quick and much needed vacation. We enjoyed a few days in the sun, celebrated Easter and indulged ourselves with lots of local foods (which now makes me constantly hungry, lol!). It was marvelous! I’ve been sharing some photos on my instagram account, feel free to check them out here. Today I’d like to share a card which I made back in February – this was a Birthday Card for my Mother. She seems to be enjoying them a lot and that makes me feel so so good! I used a beautiful die set from Becca Feeken from Spellbinders. Becca is such an incredibly talented lady! I have been a fan and a follower of hers for as long as I can remember! If you like projects using Spellbinders dies I’m sure you’ve been to her blog Amazing Paper Grace at least once. If not – be sure to stop by and subscribe! You will love her projects! 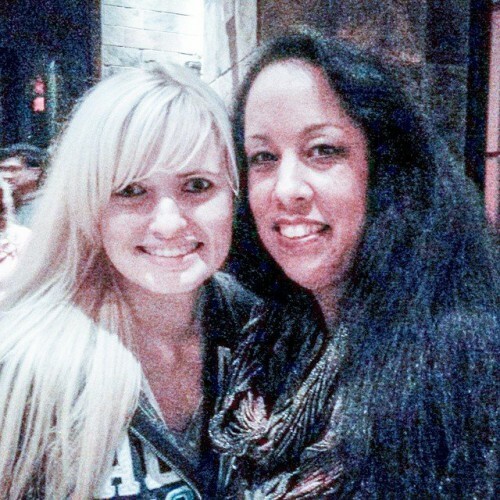 I was incredibly lucky to meet Becca at the past Winter 2015 CHA show in Anaheim and snap this photo! Becca is definitely a great inspiration to me! The way she uses dies is just remarkable! Let’s go back to the card. This is a rather large project, I usually make smaller A2 cards, but this one is slightly larger. 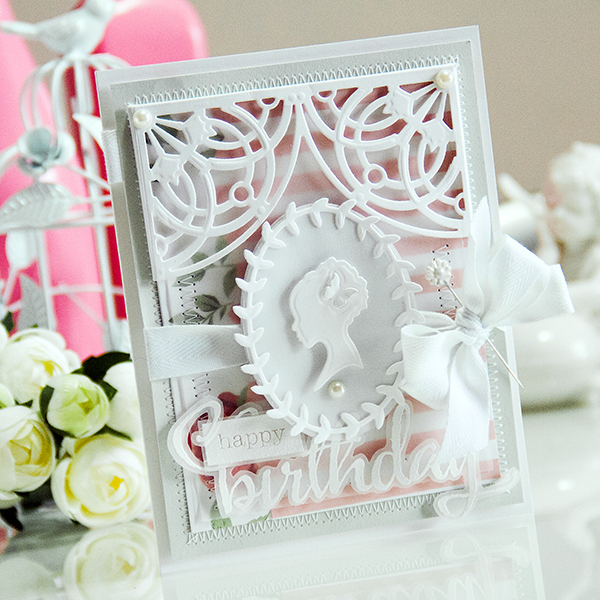 The dies that I used – the Arched Elegance Pocket are designed as pocket dies. I used those differently and created corners for the top portion of my card. I folded the flaps behind the panel of patterned paper and created an upside down pocket. 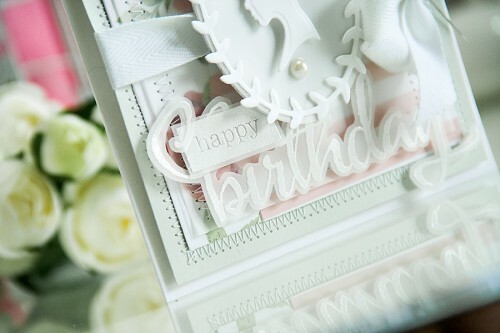 I also used a beautiful Silhouette die and cut/embossed it out of white cardstock. I think this is such a perfect die for feminine cards! Since this is a Birthday Card I’ve added a Happy Birthday sentiment. 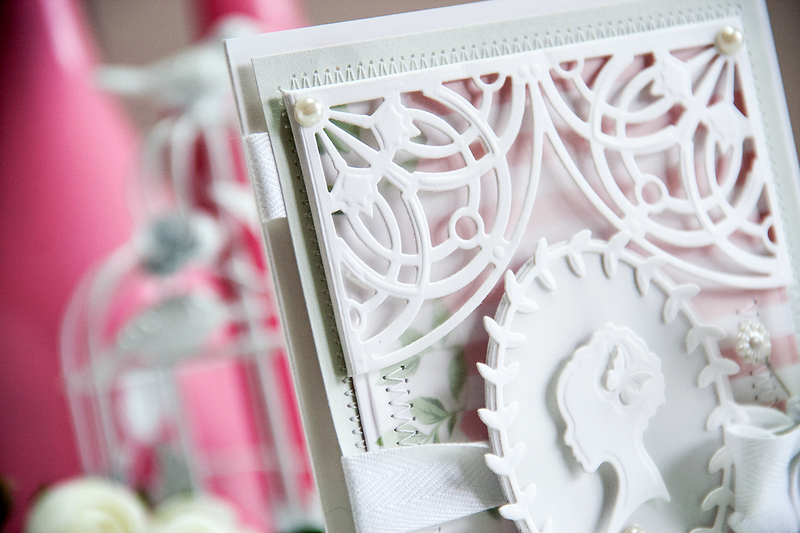 I heat embossed it using white embossing powder on vellum and fussy cut it. The Birthday stamp is from Winnie & Walter and the Happy is from Neat & Tangled. 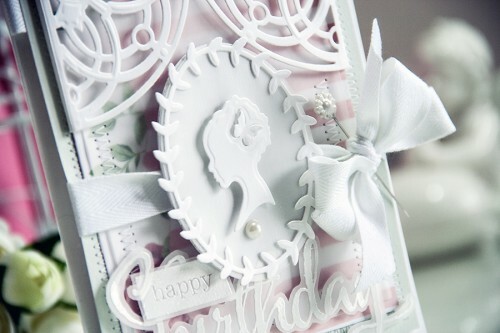 I also used ribbon from May Arts and embellished my card with a few white pearls from Want2Scrap. What size of cards do you usually make? Are you an A2 or a 5×7 cardmaker? Or maybe you prefer a different size every time? I’d love to hear from you! Thank you for stopping by today! I’m off to unpack my suitcase, do some laundry and hopefully make a few more pretty Spellbinders cards. Lovely card Yana! I love how you always place so much dimension in your cards, they are always stunning!!! thank you so very much! She loved it! Becca is definitely my fav designer. I have all her dies and use them often. Like wht you did for your Mom. Very beautiful and am sure she loved it. thank you, Ann! Yes, Becca is amazingly talented!